Two populations are known, one from Ethiopia and southern Sudan to Tanzania; the other from southern Angola and Zimbabwe to South Africa. Arid grasslands and savannas, preferring areas where grass is short. They are capable diggers and live in dens that are dug by the foxes themselves or those left by other animals such as aardvarks. Dens have multiple entrances and chambers and several meters of tunnels. A family may have several dens in its home range. 85% of activity occurs at night in the Serengeti, while in South Africa bat-eared foxes are mainly diurnal in winter and nocturnal in summer. Weight is 6.6 to 11.7 lbs; avg 9.1 lbs (3 to 5.3 kg, avg 4.15 k). Length is 18 to 26 in, avg 22 in (460 to 660 mm; avg 560 mm). 1 time in captivity an individual lived for 13 years and 9 months. Primarily consists of insects and other arthropods, and occasionally small rodents, lizards, the eggs and chicks of birds, and plant matter. The Harvester termite & dung beetles can make up 80% of the fox’s diet. Bat-eared foxes obtain much of their water from the body fluids of these insects. The termites often feed on grass above ground, where they are then eaten by the foxes. Because large herbivores such as wildebeest, zebra, and buffalo also feed on this grass, bat-eared foxes are usually found near large herds of these hoofed animals. Bat-eared foxes are also associated with these mammals since they eat the dung beetles that feed on and lay eggs in the ungulate’s feces. The foxes use their large ears to listen for beetle larvae gnawing their way out of the dung balls. 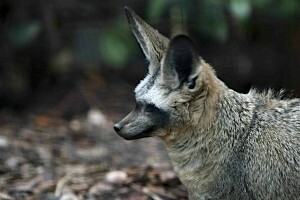 Bat-eared foxes usually forage alone. However, where insect prey is abundant, the foxes may occur in very high densities. They can actually harvest more termites by foraging in a group than if they hunted separately over the same ground at the same time. Their name comes from its enormous ears, which are 4.5 to 5.5 inches (114 to 135 mm long). The body is generally yellow-brown; the throat and underparts are pale; the outsides of the ears, raccoon-like “face-mask,” lower legs, feet, and tail tip are black. Besides the large ears, the bat-eared fox is set apart from other foxes by its unique dentition. It has more teeth than any other heterodont (different types of teeth) placental mammal with a total between 46 and 50. Whereas in all other canids there are no more than two upper and three lower molars, the bat-eared fox has at least three upper and four lower molars. On the lower jaw, a large step-like protrusion anchors a large muscle that is used for rapid chewing of insects. The legs are relatively short. To escape from predators, this fox relies on speed and it’s incredible dodging ability. It can effectively reverse direction at a flat run without losing speed. They are susceptible to predators down to the size of jackals & eagles. Diurnal birds of prey generally represent the greatest threat for young bat-eared foxes. There is no apparent commercial use of bat-eared foxes, but they are hunted in Botswana for their pelts by indigenous people.